The American Heart Association released an infographic on its recommendations for adult physical activity to maintain a healthy lifestyle. With today's more sedentary lifestyle at home and at work, it is a challenge for most adults to be physically active. Regular physical activity reduces the risk of heart disease and stroke. Aside from that, it also reduces other risk factors such as high blood pressure, high blood cholesterol, excess body weight and diabetes. Any regular physical activity from climbing stairs, walking the dog, or just stretching can have have a positive effect on the body. Dr. Russell Pate, Ph.D., a professor in the Department of Exercise at the University of South Carolina notes that one of the great public health challenges of this century is building back physical activity back into a person's daily life. “Our bodies were designed to be physically active, and they don’t do well with long-term exposure to sedentary living. Lack of physical activity is a major risk factor for cardiovascular disease”, he adds. 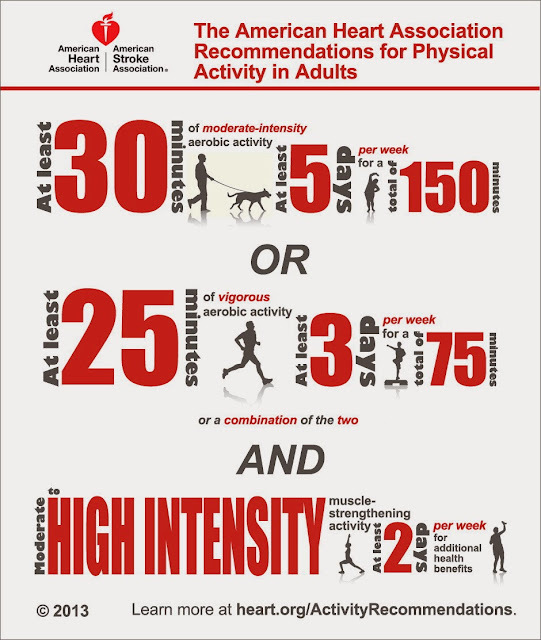 The infographic gives a general outline on the AHA's recommendations for regular physical activity that would help bring about a healthy adult lifestyle. 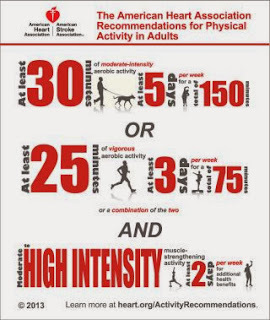 The AHA suggests at least 150 minutes of moderate exercise a week. This can be spread out to five days which comes out to 30 minutes a day. Dividing the daily routine to two or three segments of 10 to 15 minutes increases the health benefits. Physical activity helps move the body and burn calories. Aerobic exercises such as walking, swimming, riding the bike, or running benefits the heart. Strength and stretching exercises are best for overall stamina and flexibility. One easy way to get into the habit is to start walking. A walking program is flexible, has a high success rate, and easy to maintiain.